This form of skydiving has been around since the 80’s. Because most people only jump once to check it off of the bucket list, tandem skydiving is the most popular way to experience the world of skydiving. It involves a student who is connected to a specially certified tandem instructor. The pair jump together, often with a videographer to document the event. 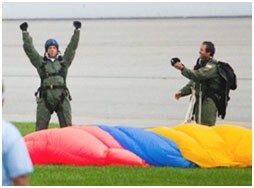 The student or the instructor deploys a parachute that is specially designed to handle the weight of two skydivers. Read more about what you can expect on a tandem skydive with No Limits Skydiving™. If you are considering making your first skydive, give us a call at 434-532-6570 or visit the skydiving reservations page for more information. Sunset is the best time to make a skydive. No Limits Skydiving™ has the only dropzones that will guarantee to have you under canopy just before the sun touches the horizon. 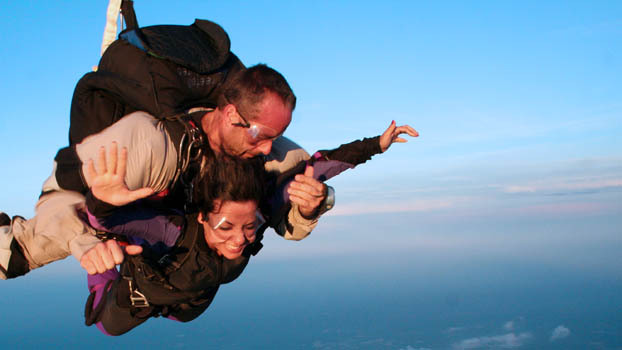 Sunset skydives are the most coveted by novice and experienced skydivers. There are only two sunset tandem skydives available each day, so be sure to make your reservation by calling 434-532-6570. 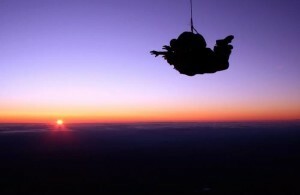 If you are only going to do one skydive in your life, make it the most memorable by jumping at sunset. Tandem students are trained in basic skydiving techniques, including body position and parachute deployment. While on the plane, the Tandem Instructor attaches the student to them by four connection points, each with a strength rating of 2,500 lbs. Two connection points are located on the shoulders and two are located on the hips. These connection points are then tightened to ensure the security of the student. Once connected, the instructor guides the student to the door of the plane. The instructor will handle everything during the jump, including the free fall and the parachute ride down. The usual altitude for a tandem sky dive is between 10,000 and 14,000 feet. The attached pair will free fall between 45 to 55 seconds, and when reaching an altitude of 5,000 feet, the instructor will deploy the main parachute. The instructor may even let the student help him steer the parachute for awhile. Tandem skydiving is very easy and gives the average person the chance to make their skydive with very little training. We guide every customer throughout the entire process, touching on safety and techniques, and letting them know their only real job is to keep their eyes open to enjoy the moment and take in the view of a lifetime. A tandem skydive is the chance to live out your dreams; it is the safest and easiest way to whizz pass clouds and live life to the fullest. Be a part of the adventure that is life. Reserve a Tandem Skydive with No Limits Skydiving™ today. The United States Parachute Association has rules governing who can qualify to be a tandem master. A skydiver must be a member of the USPA for at least 3 years, have made a minimum of 500 skydives, and possess a D skydiving License. When this criteria has been met, the candidate must attend a Tandem Instructor Course given by a Strong Tandem Examiner. This course teaches all aspects of Tandem Skydiving. Only the best skydivers attend this course and even fewer pass it. A tandem parachute system is specially designed for 2 people. The tandem parachute system has two parachutes: a main parachute and a reserve parachute. The parachutes on the tandem parachute system are similar to the design of single-skydiver parachutes. The only major difference is the size of the Tandem Parachutes. Typically, a tandem parachute is 300 to 400 square feet, whereas a parachute for a single skydiver ranges from 120 to 200 square feet. The reserve parachutes on tandem systems are also the same as regular systems, just larger to handle the weight of two skydivers. Read about our parachutes. While tandem skydiving is easiest way to experience the world of skydiving, there are things that consumers should know to stay safe and not pay too much. The prices of a tandem skydiving varies significantly based on where you buy the jump and who you buy it from. It’s important to ask the a few important questions. The articles below will help you to be an informed consumer. The more information you have, the better your skydive will be. If you don’t see an answer to your questions, give us a call. We are always happy to answer questions from those seeking to make a tandem skydive and those who just want some information. 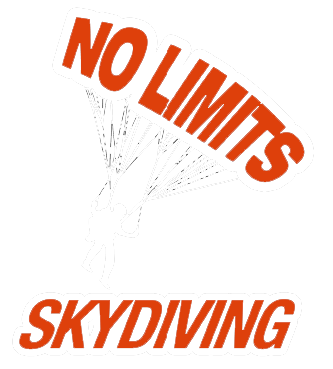 If you would like to see what it’s like to make a jump with No Limits Skydiving™, check out the No Limits Skydiving YouTube Channel. For more information on tandem skydiving, visit our Frequently Asked Questions page. Also, be sure to check out our tandem skydiving prices for deals and discounts. Our drop zones are the only skydiving schools in VA and NC that was built from the ground up to cater only to students and first time skydivers. Our drop zone is designed to make sure you enjoy your skydiving adventure. You might be a little nervous, but that’s natural. Bring the entire family and friends to watch your skydive! They’ll get a kick out of watching you jump and land right in front of them. We have a pool table, foosball, horseshoes and many other games for the kids as they wait for Mom and Dad and everyone else to skydive. So, whether you come alone or with family to experience skydiving, you will love our facilities. We hope to be a part of your skydiving adventure soon. Contact us today at 434-532-6570, or via email at nolimitsskydiving@gmail.com to make your reservation today.